European production of the Think City stopped in March. Just 1,043 units of the electric minicar were sold in 2010. Tiny electric car maker Think Global AS filed for bankruptcy Wednesday in its home market of Norway after attempts to keep the company going through recapitalization and restructuring failed, the company said in a statement. It is the fourth time Think has collapsed financially in its 20-year history. "We needed some additional funding and although we had interested investors they were not able to come to the table quickly enough," Think spokesman James Andrew told Automotive News Europe. He declined to say how much cash Think sought to remain operating, but industry sources say the company would have needed multiple millions to keep going. The future options for Think include a liquidation of its assets or the sale of the company to a new investor. 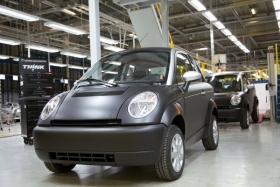 European output of the carmaker's lone model, the City minicar, stopped in March. At the time, the company said it halted the production line at contract manufacturer and Think investor Valmet Automotive's factory in Uusikaupunki, Finland, to rebalance its inventory. A court-appointed trustee from Oslo-based commercial law firm Thommessen took control of the company Wednesday afternoon, Andrew said. The trustee has responsibility for managing the company's assets, including wholly owned U.S. subsidiary Think North America, which has an EV production plant in Elkhart, Indiana. Although Think North America is a separate entity, its future also is in doubt because it is financially supported by headquarters in Norway.